When I think of my very favorite type of summer outfit, it’s one that combines bright color, fun silhouettes and seamlessly-integrated accessories. When an outfit truly flows… when everything fits and complements and shines in a poppy, fun way without sticking out like a sore thumb… that’s when I know I’ve got it right. Oftentimes, the clothing is the easy part. It’s finding accessories that really take it to the next level that’s the challenge. And that’s why I’m so excited to partner with Sole Society to show off a few pieces from their incredible summer collection! All of which I’ve found to be affordable, quality and delightfully posh compliments to any summer outing. 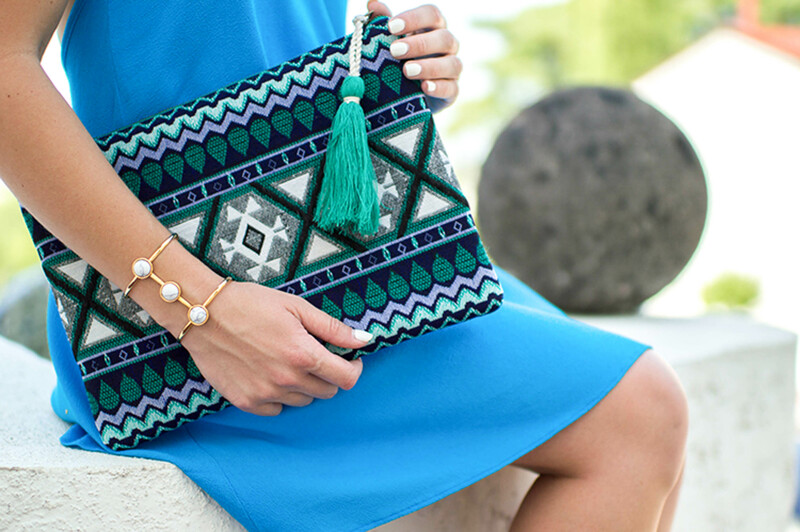 The beachy, vibrant hues and eye-catching pattern (not to mention darling tassel detail!) of this clutch had me adding it to my cart immediately. I’m always on the lookout for fun bags and clutches to liven up summer ensembles, and the whites, blues and greens in this piece make it surprisingly versatile. I was a huge fan of the $35 price tag as well! In fact, you’ll find a bunch of fun summer bags, all at great prices, here. 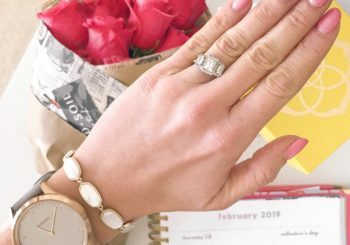 When it comes to jewelry, I am very particular in choosing pieces that compliment without overshadowing. In my opinion, nothing cheapens an outfit quite like a piece of jewelry that’s just “too much.” Less is more, in my book! And that’s why I am so in love with the gold and white bangle in today’s post. It’s elegant enough to add a touch of sophistication to any ensemble, but subtle enough to blend in elegantly. In the past, I’ve had difficulty finding these types of pieces at prices that don’t break the bank, but yet again I was pleasantly surprised by the selection that Sole Society offers! In my opinion, where Sole Society really stands out is in it’s shoe department! I’d been on the hunt for a pair of natural, brown ankle strap wedges for forever. This pair is exactly what I’d had in mind. (Don’t you love when that happens?) You’ll find a fabulous selection of popular shoe styles at prices that don’t break the bank here. 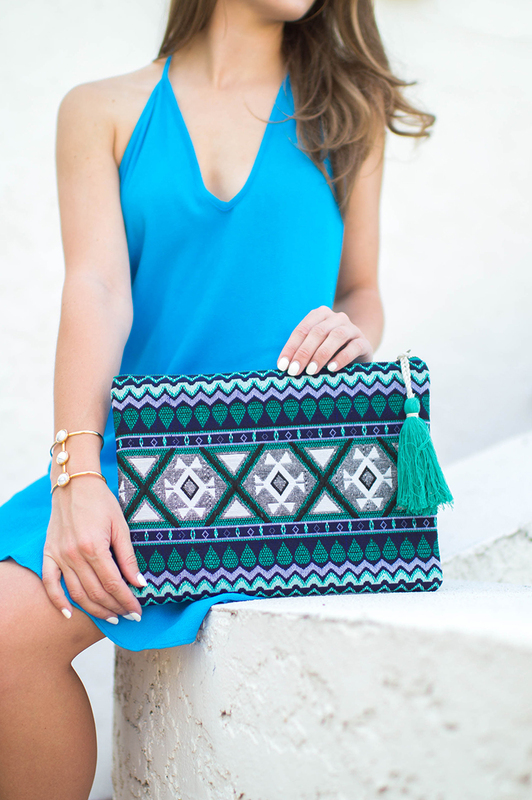 When it comes to summer accessories, I’m thanking my lucky stars Sole Society is in the picture. So many fun pieces, y’all. Which is your favorite?! I love the bangle! It is so fun for summer, but I love the whole look it all looks perfect together! Every girl needs a pair of fun wedges for summer! That clutch is everything!! I love the embroidery! That is SUCH a cute bag!!! I love it! Blue really does pop in the summer!! I love the clutch. You are right they really do have the cutest stuff! LOVE the shoes!!! Such a fun outfit!!! I don’t know if it’s just me, but lately links on your blog to the Revolve website haven’t been working. I’d love to find the gorg dress! Yeah, it’s been happening to me too lately! Well hello gorgeous!! This dress is stunning on you! Also love your tassel bag. What is your favorite brand undergarment to wear with all of your backless dresses? Your wedges pair so well with your dress- it’s so cute! This is an adorable look! i’m especially loving that clutch!